Fire Station 13. Photo by Jason. Fire Station 13 is holding an open house this Sunday, June 27, from 1:00 to 3:00 pm. The station next to Jefferson Park was designated as a landmark earlier this year. At the open house, guests may see the design of the fire station, meet the firefighters, and tour the engine. Families are welcome, so bring the kids! If you have questions, special needs, or language requirements, please contact Christina Faine at christina.faine@seattle.gov. 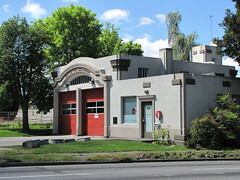 Fire Station 13 is located at 3601 Beacon Avenue South, at the intersection of Beacon Avenue South and South Spokane Street.